A-plus for blondie! I worked him in the indoor arena and he was sterling. 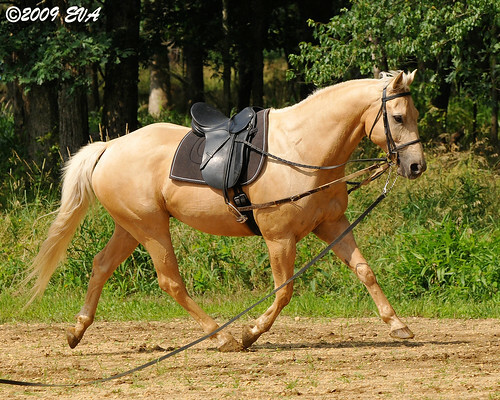 I did not longe him very long and I did not use the side reins. I mostly worked on transitions. There were people hustling and bustling around the farm and he only spooked once on the longe line. We spent about 3 minutes doing out mounting block exercise. Stand next to the block, rotate so you’re standing next to the next side, rotate again, again. Turn around, same routine. I have all but extinguished the ears-back behavior at the mounting block… hooray! I mounted up and rode for about 15 minutes. My ankle is improving but it gets very sore when I ride since I flex it. I could only stand a little bit of trotting so we spent more time working on walking exercises. We walked over ground poles, did changes of direction, and I asked for a leg yield in each direction. Everything was perfect. Good, good blondie. A+ for you. The chiropractor is scheduled to work on Wizard next Wednesday. Fingers crossed that we figure out what is bugging him.